Baby Led Weaning - Don't be afraid of getting messy! This is one of my most favorite pictures of our sweetie girl. She's covered in roasted beets and sweet potatoes. She's been eating this way from the beginning of solid foods. She's only 9 months here. I did a lot of research early on, on baby-led-weaning. Although we weren't trying to wean, she started showing interest in our food at about 7 months. We started giving her little nibbles from our food then and she's eating a bit of whole foods daily at her request. This is what a typical Sunday at our house looks like, baby food prep. Except, I'm not mashing, blending or pureeing anything. I simply roast everything on a pan, remove things that cook a little faster, remove the tough skins, dice them up into baby finger size and freeze for the week. I can't tell you how easy this is! It is also easy on the budget, but that's just a bonus. This whole experience has been wonderful for baby, mommy, and daddy. We are loving feeding her whole foods, picked ripe for eating and without any processing or extra unnecessary added ingredients. We're not including grains, or corn for a long while as we feel this is best for developing her tummy to handle those sorts of things and we're avoiding GMO's like the plague. For now, whole fruits and vegetables are on her menu. Just recently we've started to scatter in some organic roasted chicken and egg yolks here and there. We're staying away from cruciferous (except cauliflower) vegetables on the moment as those seem to be harder on the digestive system. There are all sorts of books, blogs and websites devoted to baby-led weaning. I'm not an expert on the subject, but if you're intrigued to do your own research I've included some of my favorite links below. Teach Me: Educents $5.00 Exclusive! I love free stuff don't you? Educents is offering Vintage Indie readers a free $5.00 in Edubucks! They have all kinds of things for every age child. They also have freebies, from time to time for all sorts of things. All of these gorgeous items are handmade or hand dyed from KateBlossom. "The author of the best-selling book Totally Awesome Rubber Band Jewelry is back with 15 more super-sweet projects for sensational rubber band jewelry! Packed with original ideas for both girls and boys, Epic Rubber Band Crafts shows how to use a Rainbow Loom®, Cra-Z-Loom™, or FunLoom™ to make stylish bracelets, necklaces, headbands, accessories, and action figures that will have everyone in school saying WOW! Whether you have made rubber band loom accessories before, or are brand new to the craze, this book will be your ultimate guide to creating the coolest and most colorful gear around. Discover how to put two or more looms together for fabulous results on bigger projects. Kid-friendly step-by-step instructions, hundreds of color photos, and easy-to-follow numbered diagrams make it a snap to get great-looking results. Plenty of fun sidebars, tips, and tricks are provided to keep any loom enthusiast occupied for hours.” – Epic Rubber Band Crafts official book description. One of the toys of the season last Christmas (and probably toy of the year), was the Rainbow Loom. My 9 year old got one, and we gave a few as gifts. Had these been around when I was in my “pot holder looming” stage years ago, I am sure I would have begged for a rubber band loom. They are super fun! My son loves his, but he is stuck on the basic bracelet pattern. So, when we were given a chance to try out the new Epic Rubber Band Crafts Book by Colleen Dorsey, we were super excited. After reviewing this book, I am sure it will make it to Amazon’s top 100 list. The variety of ideas was one of the first things I noticed. The book isn’t just pages of different ways to loom bracelets, but really unique ideas like hair accessories, zipper pulls, and actions figures. Ideas I haven’t seen anywhere else. Some of the crafts even incorporated beads giving them a special touch . My son’s personal favorites were the penguins and cell phone (or in his case, ipod) cover. I liked both, but have to say, the penguins are just adorable! Once we picked our favorites, we set out to create. I was a bit nervous on how this would go. When the loom was first opened on Christmas, much frustration followed. I couldn't even understand the directions, much less a child. My son ended up having to ask his older cousins to show him how to use the loom. They showed him how to make the basic bracelet, and that’s where we've been since. If the basic design was that difficult, how would we ever figure out these more complicated ones? The creations are complete and he never asked for my help! The step by step directions are clearly shown through illustrations, photos and described in a way he easily understood. The end results really were “totally awesome” and I had a happy kid! If you have a loomer in you house or on your gift list, this book would make the perfect gift! A special thank you to our special guest writer, Angela Johnson, owner and editor of Parenting In Northern Kentucky. The site is a NKY connection to all things family. Disclosure: All opinions expressed above are my own and are in no way influenced by companies or brands mentioned within. I received a copy of Epic Rubber Band Crafts in order to review. All images within the post are owned and copyrighted by Epic Rubber Band Crafts' author, publisher or other affiliation. 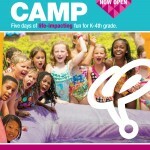 Northern Kentucky Summer Day Camp - Giveaway! It's time to start thinking about summer camp! Where would you kiddos like to go? Summer is finally on it’s way! It’s time for Northern Kentuckians to start packing up the snow shovels and start thinking: Summer Camp! We have so many wonderful programs in NKY and Parenting In Northern Kentucky has brought you a list to of them to reference. Not only that, we are giving away one full week of camp to one winner and $50 off a week of camp to another. 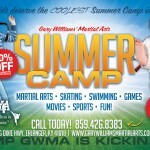 Check out these great programs the winners are able to choose from: Dominach's Taekwondo Academy, Gary Williams' Martial Arts, Camp Wave @ The Newport Aquarium, Benton Farms, and SpringHill Camps. Click on over to Parenting In Northern Kentucky and check out the full list of area summer day camps. Parenting In Northern Kentucky’s NKY Summer Day Camp Giveaway ends at midnight EST on May 1, 2014. One winner will be chosen at random via Rafflecopter. If entry is able to be verified (ie, Facebook likes, etc) the winner will be sent an email and will have forty-eight hours to respond. If no response is received within forty-eight hours, another winner will be chosen. Vintage Indie is not responsible for prize fulfillment. This site, nor Parenting In Northern Kentucky received payment or compensation for this post. Camp programs chosen by winners are responsible for fulfilling prizes. 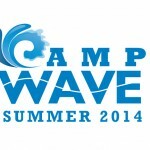 Free week or $50 must be used toward the camp programs chosen during the 2014 summer. Prizes are non-transferable, have no cash value, and may not be used with any other promotions, discounts, or coupons. See specific camp for additional specifications. I'm excited to introduce you to Jamberry Nails. If you've never heard of them, you are in for a treat. Jamberry Nails are actually wraps made of a solid film covering that you can apply directly to your nail. They are heat and pressure activated to create a water tight bond to your nail. As a mom of three children, I can say that I haven't done my nails in years. The time it took only to have them chip a couple of days later hasn't been worth it to me. I was very excited when I first tried Jamberry Nails, and I'm happy to now be an independent consultant for Jamberry Nails. I'm also thrilled that I can use these on my daughter. They are gluten free, latex free, formaldehyde free, non-toxic and free of harmful chemicals. There are over 250 designs, and styles. They have a bunch of gorgeous floral prints, perfect for your vintage style! They also have the option for you to create custom wraps, these cost a little bit more, but are a fun idea if you want something completely unique to you. I'd love send you a free sample. All you have to do is fill out my simple request form and I'll have one on the way to you soon. Vintage Indie Jams Facebook Group for contests, giveaways, and show & tell jams. Disclosure, I am Gabreial Wyatt, Jamberry Nails Independent Consultant. I do receive commission on purchases made at my independent website. After seven years, my family was blessed with our first daughter. With the birth of our sweet baby, we became somewhat new parents again. Our thoughts on raising children, nurturing their curiosity, and taking care of them changed and grew with maturity. What we didn't expect to change were all of the products available to us now, within 7 seven years the market changed and we were learning about all kinds of new inventions and gadgets. One thing we knew for certain is that we wanted to provide hypoallergenic and soft diapers for our growing girl. I think we've been successful in doing that and our recent discovery of Well Beginnings diapers from Walgreen's Stores, has been no exception in our choices. Their diapers are hypoallergenic with an extra soft inner liner complete with natural botanicals, vitamin E and aloe. They're also soft on the outside and provide enough flexibility and durability for an adventurous toddler. What about you? What do you look for in the perfect diaper for your active toddler? Headbands for your little sweetie. Last Minute Thanksgiving Decor: The Kids Table! Let's not forget the kids table this Thanksgiving! I always loved it when my grandmother set our table with her fine china and silver for Thanksgiving. It made us kids, feel very special. Here are some great products from small business owners to make the kids feel special this Thanksgiving. This is a sponsored post written by me on behalf of My Dolphin Show. Recently we downloaded the free My Dolphin Show App. It is a brightly colored app with lots of pinks and purples and would truly appeal to girls between the ages of 8 and 10. However, my son found it challenging and fun. He didn't mind the sparkle and glitter, and the female trainer. This app provides various types of game play and challenges. At each level you have a training session with your trainer. It is during these two training sessions that you learn a new skill such as hitting a basketball into a hoop, hurdles, jumping, flipping in the air, diving for fish, and many others. After you have completed the training it is time for a show. During a show you use every trick that you have learned from the beginning up to that level to impress you fans and earn coins. The more tricks that you perform correctly, the more coins you earn. The more tricks that you do during a show, the more fans you earn. These fans help you earn stars. These stars earn you additional coins after your show is over. With the coins that you earn, you are able to go shopping and purchase new costumes for your dolphin. You have the choice to keep training and performing shows while saving coins for higher priced items in the shop. You can also purchase new animals such as turtles, sharks, whales, polar bears and others creatures, to perform with. This was a great game, which even challenges adults. I had quite a bit of fun during my training and dolphin show. My son enjoyed playing along with me and we challenged each other at different levels of game play. Overall, we thoroughly enjoyed the game. I appreciated that the game was age appropriate and helped teach him about earning, spending, and saving. My Dolphin Show is a fun, FREE app in which you get to swim, play and perform tricks like a real dolphin! Over time, your dolphin will complete different tricks that increase in difficulty, allowing you to gain more points as the game continues. As a kid-friendly app, you can play along with your children and share quality bonding time in an entertaining and safe way. It is still well into the 90s here and temperatures don't seem to be falling. I love these handmade dresses from SneakyPea and could see my precious girl wearing them. With a little sweater and tights they would work well into fall fashion. If you're wondering how to get some exercise into your home school day, why not check out Fitness Blender? Husband and wife team Daniel and Kelli have created Fitness Blender and offer all of their exercises for free. You can go to their website and click on various requirements for the type of workout you would like to do. Choose from training type, body focus, difficulty, minutes and calorie burn to find the right workout for you. Everything is organized and easy to find. If you need a little more direction they do offer workout plans, but that's only if you choose to use their plans. They are also very inexpensive. The videos offered in the workout plan are the same as what they offer for free, just organized into days, and specific workouts. Today my kiddos and I did the 25 Minute Fun Workout for Kids. You can check it out below. The folks over at Fitness Blender do not know me and I was not paid for this. Just thought you would like to know some free resources for getting you and your kids moving! Today's Vintage Indie Kids is all about decorating their walls with gorgeous indie-artist, artwork. Sponsored Feature: Invisalign and what I wish I would have known then. Truth in Review: This is a sponsored post. However all thoughts and opinions are my own. Let's go back about ten years as of last month. Walking down the isle in my beautiful wedding gown, waiting for my prince charming at the other end. Wedding pictures galore and memories to last forever. A beautiful night and an amazing memory for sure. However, roll back time a few months before the big day when I decided to get braces. At the time I'm not sure why I chose to get braces several months before my wedding day, but I was determined to finally get the straight teeth that I always wanted. Fast forward to the present time and you won't find many wedding photos adorning our walls. One of my biggest regrets were the big metal braces in every single photo. I wish I would have known about Invisalign then. Invisalign would have prevented those big wrap around braces from entering all of my beautiful wedding photos. In fact, I could have taken my Invisalign aligners out for pictures. Yep, that would have been nice. This time around when it comes to my boys and their teen years of the ultimate need for braces thanks to me and their dad, we'll be looking into Invisalign Teen. Some of my favorite aspects of Invisalign Teen is that they can be removed to eat. No more worrying about flossing, flossing and let's not forget all of the flossing! Of course that means, you can't just forego the flossing but I can imagine the frustration of having to remind them to floss after every little bite. Afterall plaque build up isn't fun. When looking ahead to our near future of braces, I'm excited that the cost of Invisalign is roughly the same compared to traditional metal braces. I'm also thrilled that if they want to play sports, or play a musical instrament that they can remove the aligner to do so. No more risk of broken wires, brackets and painful pokes in the side of the cheek. Visit the Invisalign Website for more information abou the clear alternative to braces. What about you? Have you used Invisalign? And if so, what was your experience? Visit our Disclaimer/Disclosure Page for more information. I'm a sucker for anything strawberry related. They're cute and sweet just like my sweetie girl. Head over to MiaPiccina to see more of her hand knitted creations and of course more adorable strawberries. Oh boy! I can't wait until my little sweetie can pull out the dresses. I think these will do. Handmade from Wee Stitchery, they are simply adorable! Some are even created with vintage fabrics! Visit Wee Stitchery to purchase any one of these adorable outfits! Babies require a lot of diapers, as if you already didn't know. It had been quite awhile since we embarked on the diaper and wipes scene and forgot all of the perks that come with changing such a sweet little angel. You know, the leaky wet diaper in the middle of the night or the afternoon blow-out on your way to somewhere important. Ultimately these things can happen.Should they happen? That's a question to ask yourself, that's why finding the perfect diaper for your baby is an important task. Recently we were sent a package of SIMPLY RIGHT™ diapers and wipes. With their new thin absorbent core for leakage protection and thin, but flexible fit the diapers size 3 fit our baby girl just fine. We appreciate that the back is a little longer and comes up a bit to protect leakage from the back. We are somewhat mobile around here with an army crawler, so flexiblity has been important, especially for one on the go and we've been pleased with the stretchy sides of the diapers. Wipes in our house are an important factor when cleaning baby's bottom, and hands and sometimes arms and legs on the go. We also like to keep a pack in our car for travel clean up. SIMPLY RIGHT™ baby wipes are strong, and soft with a thick texture for cleaning up messy jobs. Most importantly to us is that they are fragrance-free, hypoallergenic, and easy going on delicate baby skin. We love the packaging around here and the ease of use getting the wipes out of the package. Sometimes you'll be wresting a baby to diaper and the wipes from other well known brands get stuck together and come out in a long strand of wipes making it difficult for one handed jobs. On top of the above qualities mentioned above SIMPLY RIGHT™ baby products are a great value. Members saved up to $392/year by purchasing these SIMPLY RIGHT™ baby products. That's $392 a year I'd rather spend purchasing good whole organic foods for baby to eat! What do you think? Are you up for saving some cash? Disclosure: This is a sponsored post written by me on behalf of SIMPLY RIGHT™ Baby Care Products. Visit our Disclaimer/Disclosure Page for more info. It is Indie Weddings Month here and we're bringing you the latest and greatest goodies from small, handmade and vintage shoppes from around the globe. Today's Flower Girl dresses don't disappoint and remind me why I love shopping handmade! How you can you not fall in love with these whimsical dresses from wildthingsdresses. My sweetie girl needs everything in this shop! I love these handmade knitted wool socks and "happy mittens" from JurgitasHandicrafts. I'm really adoring these darling mittens and ear muffs from Rainbow Mittens. Isn't she adorable! What a great gift item to start a little collector in your family. The joys of having a daughter, I tell you! Dresses, galore and vintage to boot. Any one of these darling vintage dressing would be perfect for your little Valentine. It has been over seven years since our last baby. While a lot of it is like riding a bike, many of the smaller details have slipped my mind like changing the baby in public places. While many places offer a baby changing station which I appreciate, they are lacking in the cleanliness that I would approve for my sweetie girl. That's when babypenelope came into play. Their gorgeous handmade changing pads were just what we needed. Handmade construction, soft cushion, machine washable, and boutique quality fabrics make the changing pad a perfect fit for on the go with baby. I also love that you can roll up the changing pad and velcro it together for easy storage. This diaper/wipes holder from babypenelope is great to keep the pair together in your diaper bag. Matching accessories are important right? Visit babypenelope for these accessories, crayon holders, cosmetic bags, burp cloths, and more! A special thank you to babypenelope for providing these items for our review. We were not paid for any content, links or other information included in our article. All comments are opinions of ours and have not been purchased. Please see our disclaimer, disclosure page for any further information.